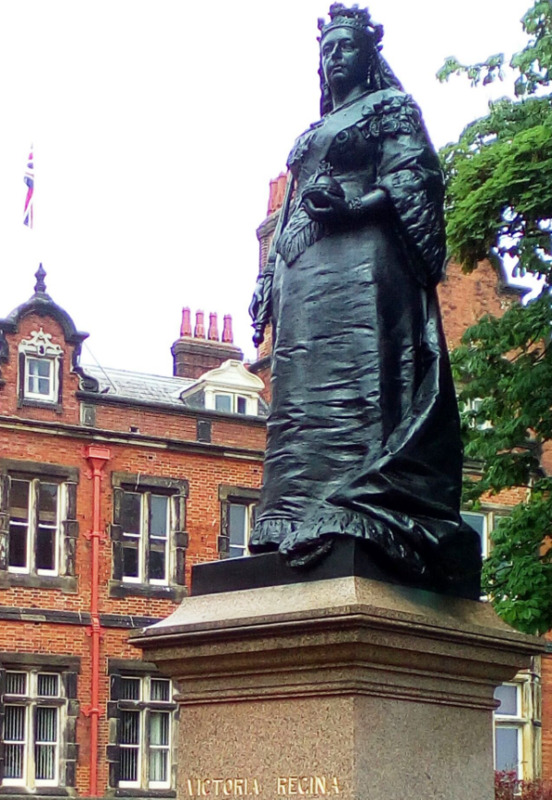 The Civic Society decided to restore the statue because after decades of being subject to an unforgiving coastal climate, the statue was in poor condition. Raising the money for this project was hard work. Maggie Flowitt made a major donation in memory of her husband Richard who was the Vice Chairman of Scarborough Civic Society for many years and this kick-started the process. Then money flowed in with major donations from the Mayoress?s Community fund and Tesco Bags of Help. 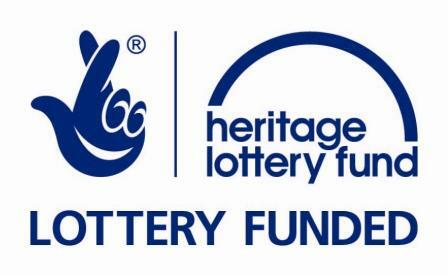 Other significant donations were received from The Lightbox, Bright?s the Jewellers, Central Tramway, Rebecca Shaw, Bonnie Purchon, Tom Pindar, Richard Ward, Jean Glover, Chris Perry and Cllr. Andrew Jenkinson. We also received many smaller donations which along with all the Civic Society events and raffles driven forward by Bonnie Purchon, combined to make the project possible. 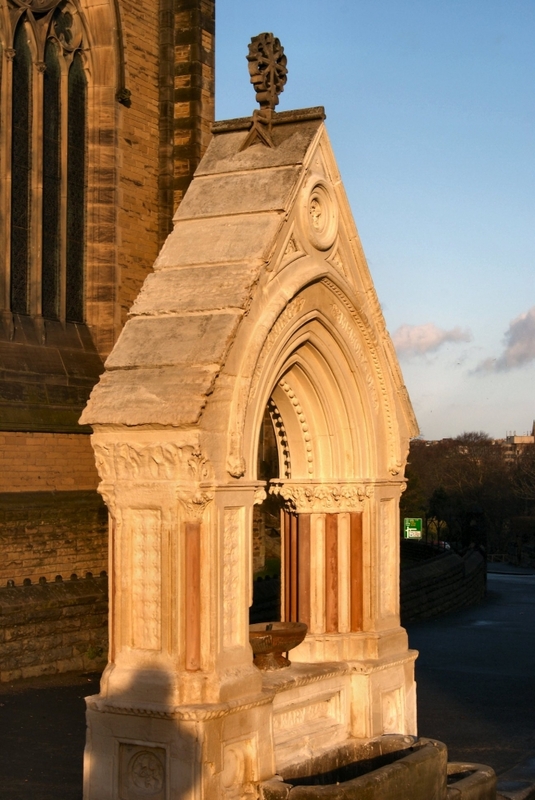 As the structure is listed grade II we couldn?t attach anything to it so we located a separate interpretation board near the statue which provides details about the statue and the Town Hall. 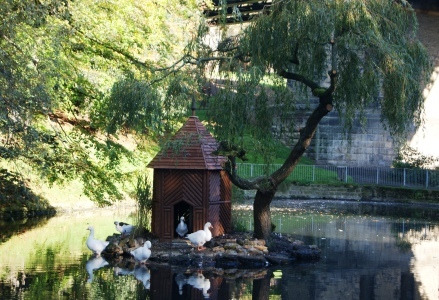 The duck house in Valley Gardens has had a large hole in the roof for some years but finally it is being replaced. 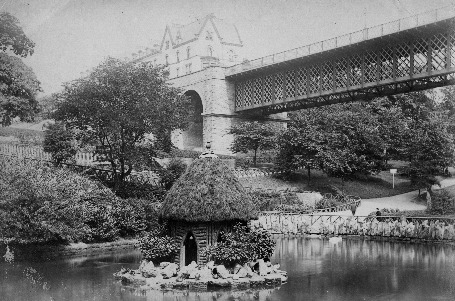 As you can see by the picture of the original there has been a duck house on this island for over 100 years! The Civic Society Shelters group have been working on improvements to the shelter overlooking the Holbeck Putting Green. 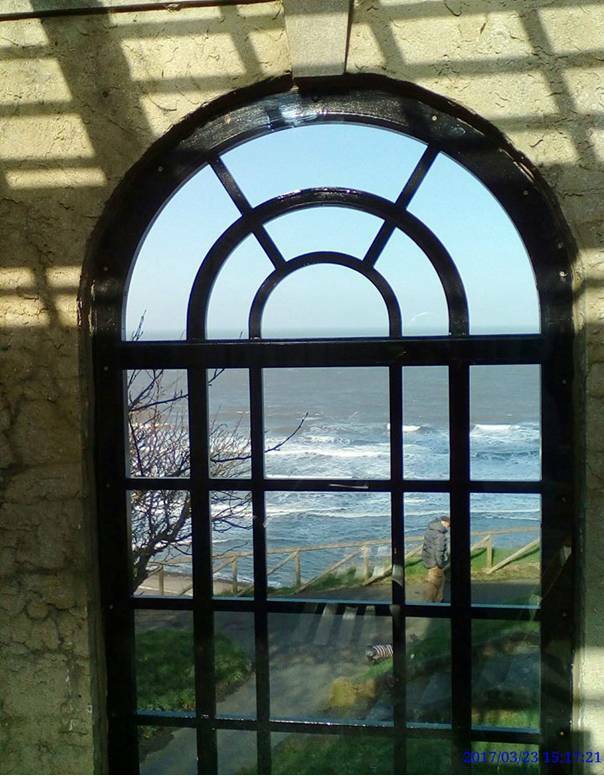 With the generous help of a ?2K grant from North Yorkshire County Council we have been able to reinstate two windows and the views to the seaward side of the shelter are stunning. The frames are authentic and the shelter looks so much better than before. The picture below shows the shelter in 1969 before it was converted into an electricity sub-station. The electrical equipment which was in shelter 3 was relocated into the Spa buildings and it has now been possible to restore the shelter. When we met with Dale Electrics Apprentices in December 2014 and explained how for three years we have been trying to get shelter 3 returned to its former glory. They immediately understood the value of such a project and won the 2015 Brathay Apprentice Challenge for completing this project. 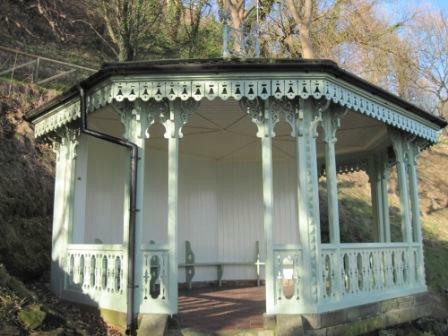 In 2005 a sub-group was set up as the Civic Society shelters group to take a special interest in the preservation of shelters within the town. 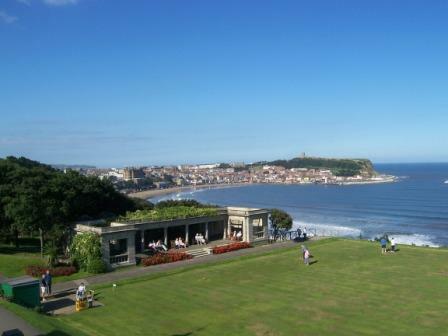 Click here to see the result of the work done in South Cliff Gardens with the society working closely with the council. 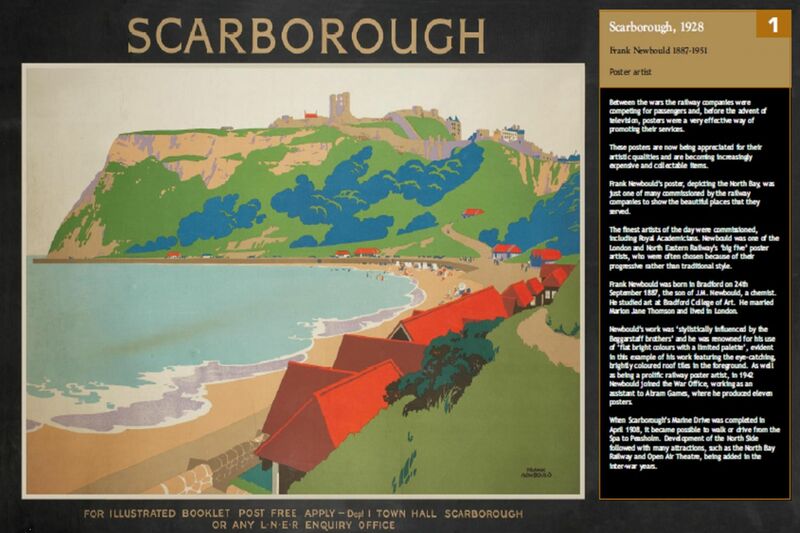 Richard Blades a local artist was commissioned by the Civic Society to paint a panorama of the South Bay featuring the wonderful Sun Court at the Spa as a part of the Civic Society's 50th year celebrations.The Civic Society committee wished ensure that the painting would be on public view and are pleased that Sheffield International Venues, who operate the Spa Complex in cooperation with Scarborough Council, kindly agreed to hang the painting in Farrer's Bar. The painting "Belief" was handed over to Steve Brailly, Chief Executive of Sheffield International Venues at the Gala Concert at the Spa on Thursday the 11 th of September 2014. 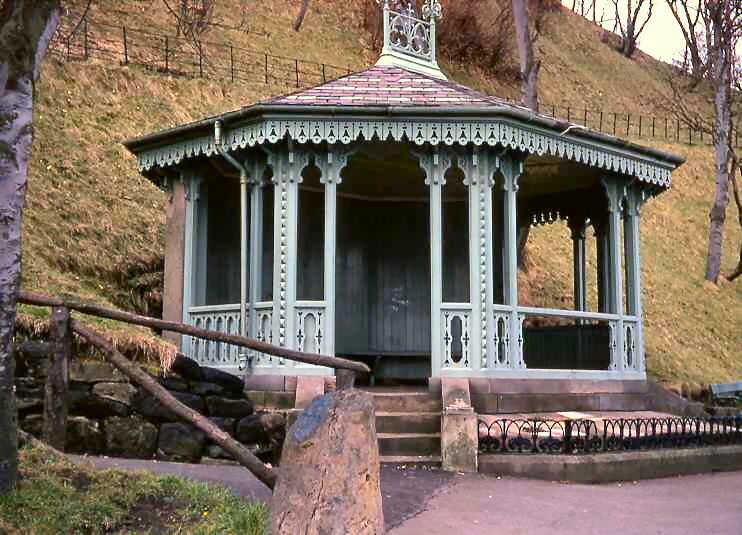 In 2014 as part of the 50 years anniversary Scarborough & District Civic Society has funded repairs to the water trough on Sandside. This very fine water trough is on the opposite side of the road from the Newcastle Packet public house and was erected in 1908. The trough was in need of some ?TLC? and in order to complete the project first contact was made with SBC and the necessary permissions were gained plus an agreement for the planting of the trough. 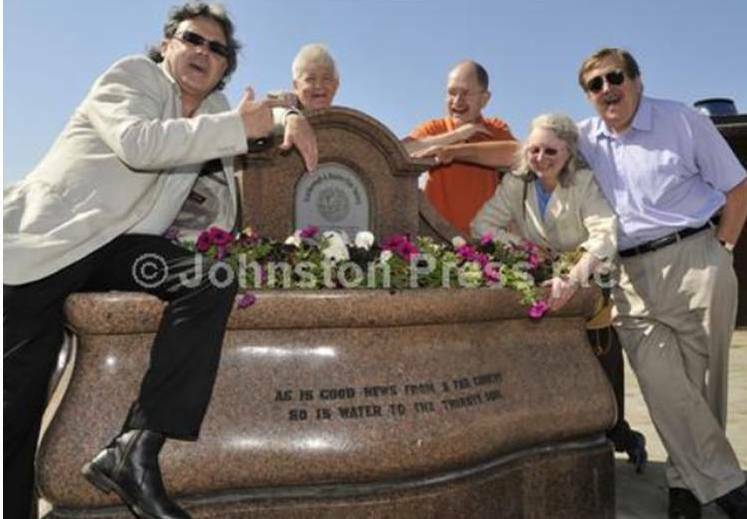 The society funded repairs to the Mary Fountain which is on the pavement at Ramshill.